Technology continuously changes the way we interact with office devices and workspaces. From multiple-monitor and multiple-device setups to the rise of the mobile workforce - the need for more versatile workstation solutions has never been more apparent. 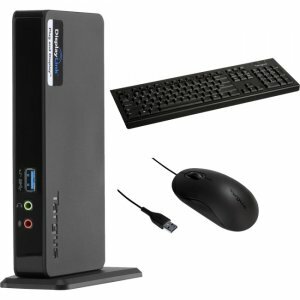 The Targus Universal Workstation Bundle offers a comprehensive workstation solution that meets corporate IT standards and includes a USB Keyboard & Mouse as well as a Universal USB 3.0 SV Docking Station.